By now you've probably watched the new Avengers: Infinity War trailer a thousand times like I have, but have you noticed anything missing? 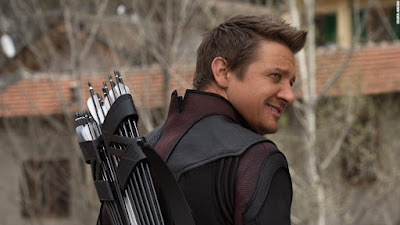 While there are about two dozen Avengers running around, not to mention Thanos and his Black Order, nobody seems to be able to find Hawkeye anywhere. What's up with that? A frequent complaint since Jeremy Renner notched his first arrow as Clint Barton way back in 2011's Thor is that his character has been given short shrift, but this seems particularly egregious. Well, there's apparently a reason Hawkeye isn't anywhere in the trailer or the promotional images, and frankly the answer given by co-directors the Russo Brothers sounds like a bunch of crap. A special spot that places him out of the promos? Just for choosing Cap's side? But that hasn't stopped us from seeing Falcon, Black Widow, Black Panther, Bucky, and others who stood against Iron Man's support of superhero registration. Whatever. I'm going to go with there were simply too many characters to promote them all and Hawkeye wasn't "cool" enough to warrant attention. That and there's a good chance he appears in this movie not as Hawkeye, but under the guise of Ronin. Meanwhile, Twitter artist BossLogic has dropped two great pieces of fan art. The first is a poster with enough Hawkeye to last until he's killed off next month (Kidding! Sorta.). 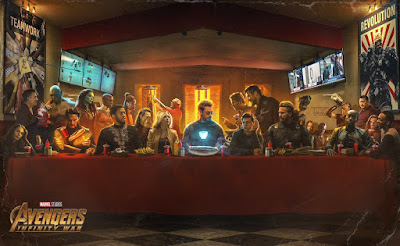 The other, seen below, features most of the Avengers crew coming together for "The Last Schwarma". A cool way to end Infinity War is if Thanos and the Black Order stop for some schwarma before blowing up the planet.